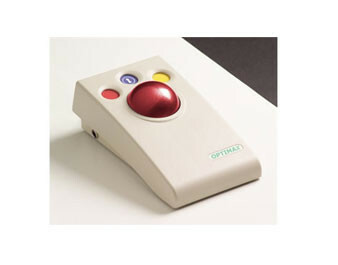 The very first wireless trackball specifically for users with motor skill difficulties. With an operating range in excess of 32 feet, it is ideal for use with groups or in the classroom to ensure that everyone can join in! Lightweight and robustly constructed with no mechanical wearing parts, OPTIMAX can be used as either a desktop or hand-held unit. Optical technology ensures precise cursor control and the bi-directional radio link provides interference free operation. Two additional sockets for switches. Provides a natural hand rest for comfort. Color-coded buttons mounted sub-flush to prevent accidental operation. Trackball sockets to operate left/right click buttons from remote switches. Easy 'plug and play' installation and auto detecting PS2 and USB protocols.